We are looking for support with the BRENT LODGE BIG BUILD Capital Appeal that will enable us to move towards reaching our vision. So we would like to ask for your consideration to support us to make an even bigger impact on British Wildlife. BRENT LODGE BIG BUILD Capital Appeal started in 2015 after receiving some generous legacies from loyal supporters. 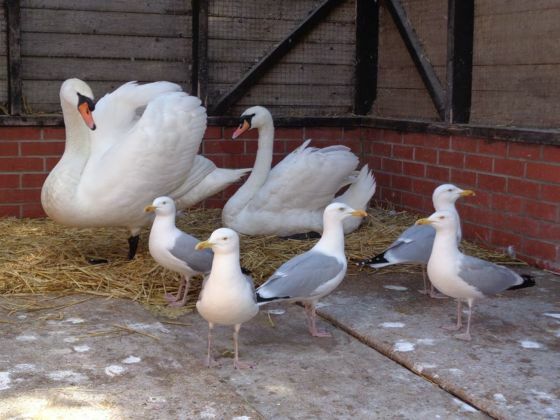 This enabled Brent Lodge to complete Phase 1 of the BRENT LODGE BIG BUILD Capital Appeal which included demolishing two old buildings to create a new feed store, build 3 new aviaries, and construct an educational hut for when we host educational visits. Phase 2 will be undertaken in 5 stages. These will include 12 new bird of prey aviaries, 5 new water pool enclosures, mammal rehabilitation enclosures, a reception and quarantine area. Finally, the new hospital extension will begin which then allow us to redevelop our existing hospital to also bring that up to a modern standard. Stage 1 to construct 12 new bird of prey enclosures was completed in 2018, we are now seeking your support for both Stage 2 and 3 each estimated at £35,000 each, so we would like to ask for your support towards achieving this. We would be happy to provide naming or memorial opportunities with these projects too. GIFT AID IT!! At no extra cost to you, when you give a donation or subscribe to our membership scheme, we can claim back the tax you have paid thus maximising the gift you have given. Every penny can then be put to good use. All you have to do is click the gift aid box on the donation or Standing Order form. You only have to do this once it will apply to all future donations you may give us. Thank you for visiting our Givey page. When you make your donation through Givey, the Charity receives 100% of the donation. Your details are safe with Givey and donating is completely secure. Whatsmore, they never share your email address with any third parties except the Charity you donate to.